Take your phone to a new carrier without a contract. Save money when you travel internationally. An unlocked cell phone is worth more money. Constant network coverage no matter where you are. How to unlock my NEC phone with doctorSIM? 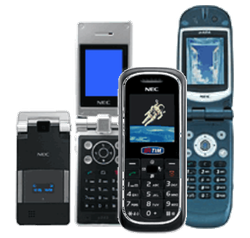 Unlocking your NEC cell phone with doctorSIM couldn't be easier! 1) Request your unlock code online, 2) Receive your unlock code by e-mail, 3) Insert the unlock code into your phone. How long will it take doctorSIM to unlock my NEC cell phone? The Guaranteed Delivery Time will be displayed on the screen once you have selected the network provider to which your cell phone is locked. You will also be given the Average Delivery Time of the previous 20 unlocking requests for that particular device. doctorSIM supports over 30 safe payment methods depending on your billing country/region and the currency in which you want to pay. Check the options available to you when requesting your unlocking. If I unlock my NEC cell phone with doctorSIM, can I use it on any network? An unlocked cell phone will work on any compatible GSM network in the world. It will not work on a network using CDMA technology such as Verizon or Sprint in the United States. We recommend contacting your new carrier to confirm compatibility prior to unlocking your NEC. Can I still unlock my NEC cell phone if the software has been modified? doctorSIM will not be held liable for any modifications to your NEC. You will need to restore your cell phone to factory settings and assume the risks of having possibly altered key components of the phone's software required to unlock it. We do, however, guarantee our IMEI-based unlocking services will work with the original software and all future updates. Can I trust doctorSIM? Will I get my money back if you cannot unlock my cell phone? We are the premier online cell phone unlocking company having processed over 5 million unlockings worldwide to date. In the rare event we cannot unlock your NEC for any reason under our responsibility, we will issue you a full refund. My NEC has been reported stolen. Can you help me remove it from the blacklist? Our unlocking services are for removing the network restriction so you can use your NEC with any other compatible carrier in the world. Regrettably, doctorSIM cannot remove a cell phone from the blacklist. Only the network carrier that reported the phone can whitelist it. Will I lose the warranty if I unlock my NEC? Network unlocking a cell phone will not void the warranty. Our IMEI-based unlocking services are officially recognized and recommended by the phone manufacturers themselves. The unlocking process is carried out remotely meaning your cell phone never has to leave your side. The easiest way to unlock your NEC cell phone. Permanent phone unlocking without leaving your home. Maintain your phone's warranty intact. Switch between networks ensuring constant service. Over 5 million successful unlockings since 2007.